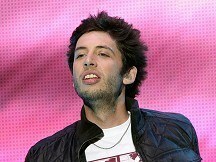 Example saw off new entries from two other dance acts to hold on to the number one spot in the singles chart. The Londoner, whose real name is Elliot Gleave, saw his single Changed The Way You Kiss Me win a three-way battle with Calvin Harris, who went in at number two with Bounce, and Ed Sheeran, who was at number three with The A Team. Other new entries in the Top 40 were Spaceship by Tinchy Stryder and Dappy at five, and Katy Perry's latest offering Last Friday Night (TGIF), which went in at 24. Lighters by Bad Meets Evil Ft Bruno Mars entered at 37. Bad Meets Evil is a collaboration between rappers Eminem and Da Royce. In the album chart, Take That rose 10 places to take the top spot with Progress. It was the biggest-selling album of last year and is back at the top of the charts again after the release of a new version featuring an extra eight tracks. New entries included So Beautiful or So What by Paul Simon at six and Hell - The Sequel by Bad Meets Evil at number seven. Frankie Laine's Hits was at number 16, 2 by Black Country Communion at 23 and Year of the Wolf by Nerina Pallot at 31. Sophie Ellis-Bextor went in at 33 with Make A Scene and Neil Young's A Treasure charted at 38. Amy Winehouse has pulled out of two music festivals she was due to appear at this week as she "cannot perform to the best of her ability", her spokesman has said. Amy Winehouse has reportedly been booed and jeered at a concert in Serbia's capital that kicked off her European tour. Fans and their parents have spoken of their anger at massive traffic delays which led to them missing much of a JLS and Olly Murs concert. Eliza Doolittle has revealed she is experimenting with new songs - but isn't feeling any pressure to make a second album just yet. Erykah Badu joined with musicians including Roy Ayers and rapper Rick Ross for a US concert to mark the 40th birthday of the late rap star Tupac Shakur.